Disney's Apple Caramel Pie is a fall staple this holiday season. You will love the sugar cookie bottom, apple filling with cinnamon spices, a delicous crunchy topping and then coated with caramel. You can find this delicious Apple Caramel Pie in Disney World at the Whispering Canyon Cafe in Disney’s Wilderness Lodge. It’s a moderately priced restaurant in Walt Disney World with a lot of personality. It has a fun atmosphere your whole family will enjoy, and of course you’ll have to try the Disney’s Apple Caramel Pie for dessert. You will love the sugar cookie bottom, apple filling with cinnamon spices, a delicous crunchy topping and then coated with caramel. It would be perfect for your Thanksgiving and holiday dinner dessert. And the best part is that it’s so very easy to make. 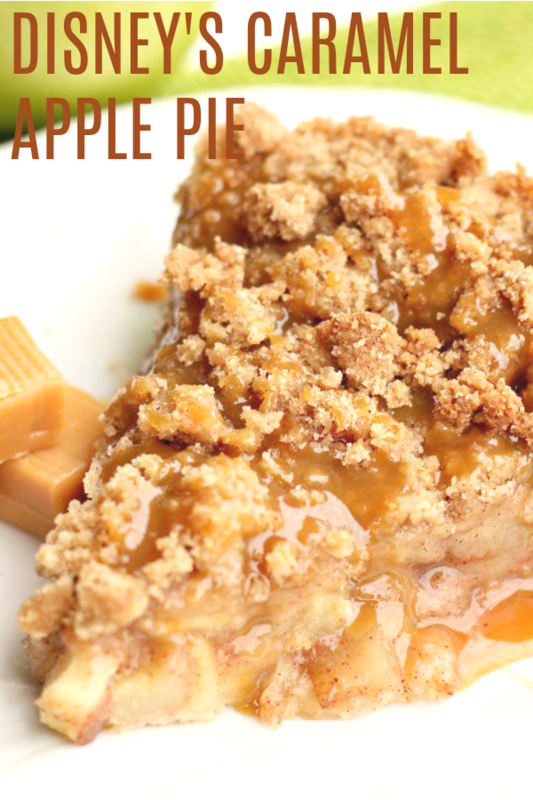 The best part about this Disney’s Apple Caramel Pie is the secret ingredient crust. It’s cookie dough! Step 1: Heat oven to 350 degrees. Lightly spray a 10 inch springform pan or a pan similar to that size with an edge. Step 2: Mix the cookie dough and flour in a bowl until combined well. Step 3:Press into the bottom of the pan and go up the side of the pan about 3/4 inch. Make sure it’s completely covered with no holes. Step 4: In a mixing bowl toss the apples with sugar, flour, and apple pie spice and then turn into the prepared crust and carefully spread out evenly. Drizzle 3/4 cup caramel topping over the apple mixture. Step 5: Cover with aluminum foil and cook for about 45 minutes. Step 6: While the pie is baking, combine flour, brown sugar, sugar, vanilla and apple pie spice. Step 7: Cut in the butter mixture and mix until if forms a wet crumb mixture. Step 8: Remove pie from oven and take off the foil. Sprinkle crumb mixture over the warm pie. Step 9: Bake in the oven and do not cover. Continue baking for another 15 to 20 minutes or until the topping is lightly browned. Step 10: Allow the pie to cool and then remove springform pan sides. When ready to serve slice the pie and then drizzle with additional caramel topping. Don’t have a Spring Form Pan? Not to worry. You could also make mini pies in a muffin tin. Lightly spray your muffin tin with non stick cooking spray. Follow the recipe as directed but change the cooking time. You will want to cook for 25 to 30 minutes or until the edges begin to golden. Watch carefully to be sure you don’t overcook. Can you make this pie ahead of time? We don’t recommend cooking it ahead of time. You can however, prepare it, but we it tastes best when it comes out warm and fresh. We also don’t recommend freezing and thawing it. The juices get the crust and topping a little soggy, and it doesn’t reheat the same. You most definitely could. They will have a little more juice to them, so you will want to add about 7 extra minutes to the baking time. We have hundreds of easy and delicious recipe on our Youtube Channel. We take you through step by step, and show you how to make each recipe. 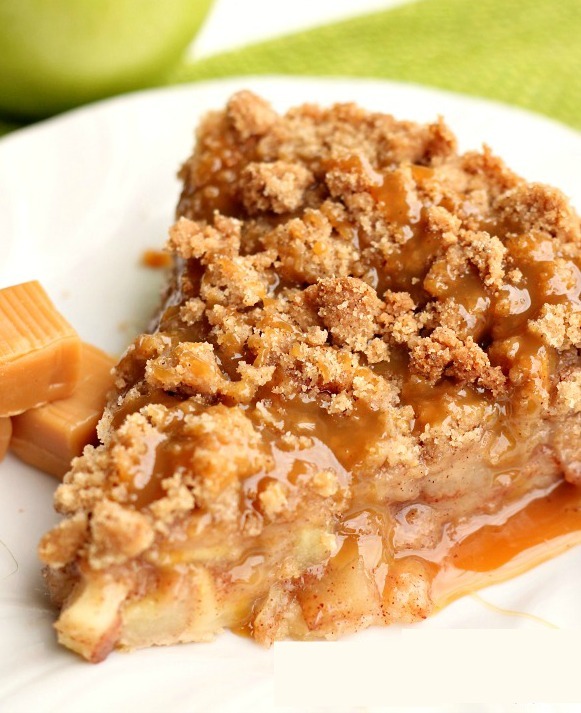 This is the best apple caramel pie with a delicious sugar cookie crust. Heat oven to 350 degrees. Lightly spray a 10 inch springform pan or a pan similar to that size with an edge. Mix the cookie dough and flour in a bowl until combined well. Press into the bottom of the pan and go up the side of the pan about 3/4 inch. Make sure it's completely covered with no holes. In a mixing bowl toss the apples with sugar, flour, and apple pie spice and then turn into the prepared crust and carefully spread out evenly. Drizzle 3/4 cup caramel topping over the apple mixture. Cover with aluminum foil and cook for about 45 minutes. While the pie is baking, combine flour, brown sugar, sugar, vanilla and apple pie spice. Cut in the butter mixture and mix until if forms a wet crumb mixture. Remove pie from oven and take off the foil. Sprinkle crumb mixture over the warm pie. Bake in the oven and do not cover. Allow the pie to cool and then remove springform pan sides. When ready to serve slice the pie and then drizzle with additional caramel topping. 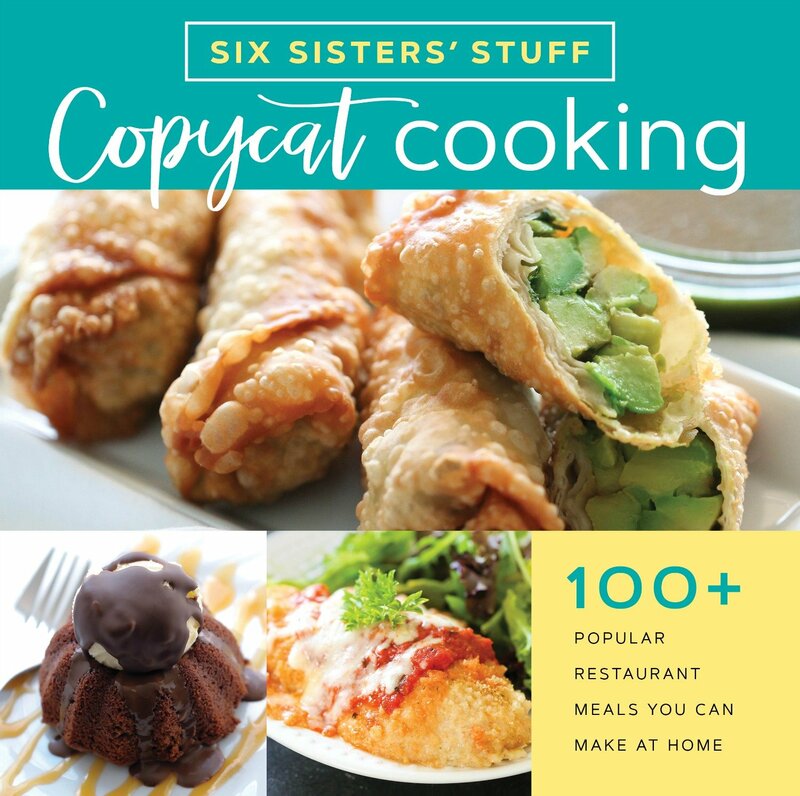 did you know we have cookbooks? Need help planning your Disneyland or Disney World trip? Book with Get Away Today! They’ll take care of you! Check out these Disneyland Travel Tips! may I ask why not a pie pan? A pie pan could work too. We like it in the spring form pan because it's a little bigger and the sides are deeper. You can also remove the sides and it will look really nice. What if you can't get pre-made sugar cookie dough? Hi Wanda. The pie does have a lot of liquid. We put it in the fridge and that helped it set up. Not sure if you tried that. It is gooey when not all the way cooled. Hope this helps. Have a great day! I have two questions. First, I've never made caramel. Am I missing the directions for making it in this recipe? Second, regarding the use of a pie pan. I have a deep-dish pie pan that I'd like to use. Any reason I shouldn't if I can come up at least an inch from the bottom? I'm hoping to make this for July 4th weekend, so trying to prepare now. :-) Thanks for the help! Hi Christi, This recipe calls for caramel topping (the caramel you would use on top of ice cream). No homemade caramel. We added some Kraft caramels in the picture. And your pie pan should work great! I hope this helps you and have a great 4th of July weekend! This is the best Apple pie I've ever made. Thanks. Thanks Jody!! We are so glad you liked it. Thanks for your sweet comment. Have a great day! Do you think I could make this a week in advance and just freeze it until Thanksgiving? or is it best to do it fresh? Hi Shantelle, we have not frozen this pie. We usually eat it on the same day or one day after we make it. But looking over the ingredients, I think it would freeze fine. So I wanted to make this for thanksgiving. So it will be fine if I made it Wednesday and served it Thursday? Should I reheat it? Do you serve it cold from the fridge? I was just wondering if you ever froze this pie? If you did, how did you heat it up or defrost the pie for Thanksgiving? And did it turn out good? This pie was horrible. The crust never baked properly. Filling was thin and watery. Sorry, this was a big disappointment will not make this again. Is the butter supposed to be melted or softened for the topping? The butter is at room temperature for the topping. Can you use canned Lucky Leaf apple pie filling instead of fresh apples. We have only made this recipe as directed. I'm sure it would work, you would need to make some adjustments since the apple pie filling has the gel in with it. Can this recipe be made in a large muffin tin to make mini apple pies? It should work fine making mini pies. The cooking time might need to be altered. Just watch closely so it doesn't burn. think this can be made in a 13x9 pan? It can be made in another sized pan, but you will need to watch it closely for the difference in cooking time. So... in the written recipe it doesn't say anything about baking the crust before adding the apples. However, in the video, it is handled with hot mit before adding the filling. Is it supposed to be pre-baked? She just had the hot pads on her hands. It's not prebaked. Just follow the instructions as directed on the recipe. It already cooks for 45 minutes, then an additional 15. So that is plenty of cooking time. Hope this helps. I agree with this comment, it definitely looks like the dough has started to cook as well. Do we bake the dough a little before adding in the toppings? I thought it was really sweet but others thought it was really good. It was really big and thick.